2 Information in this document, including URL and other Internet Web site references, is subject to change without notice. 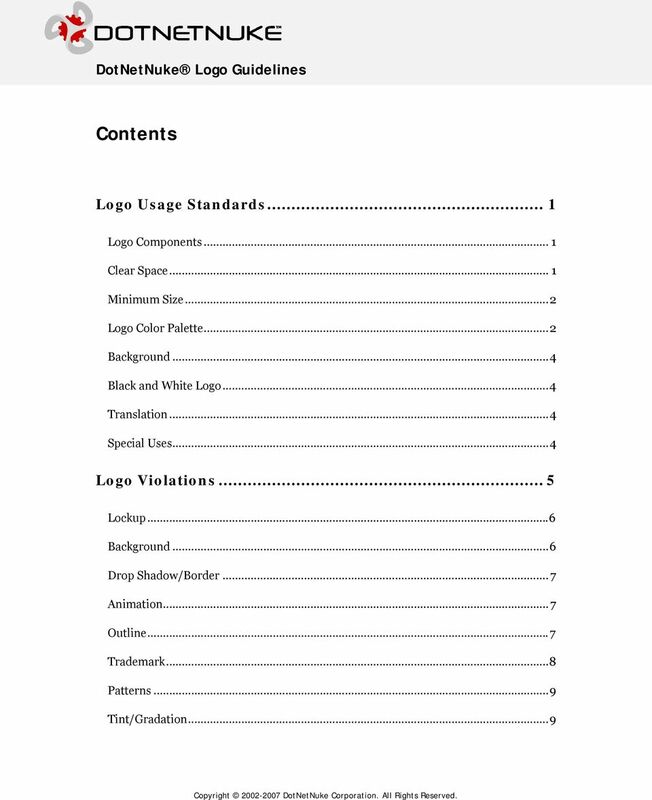 The entire risk of the use or the results of the use of this document remains with the user. The example companies, organizations, products, domain names, addresses, logos, people, places, and events depicted herein are fictitious. No association with any real company, organization, product, domain name, address, logo, person, places, or events is intended or should be inferred. Complying with all applicable copyright laws is the responsibility of the user. 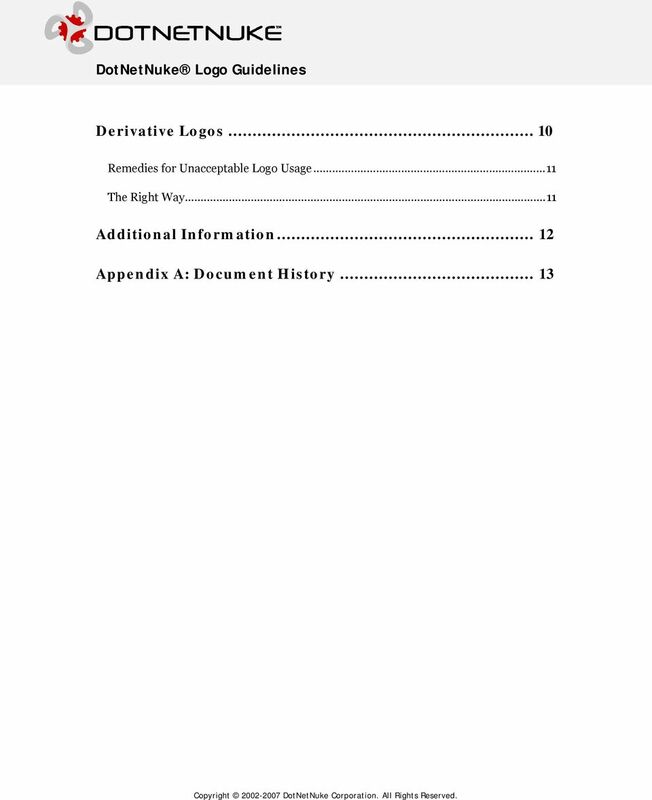 Without limiting the rights under copyright, no part of this document may be reproduced, stored in or introduced into a retrieval system, or transmitted in any form or by any means (electronic, mechanical, photocopying, recording, or otherwise), or for any purpose, without the express written permission of DotNetNuke Corporation. 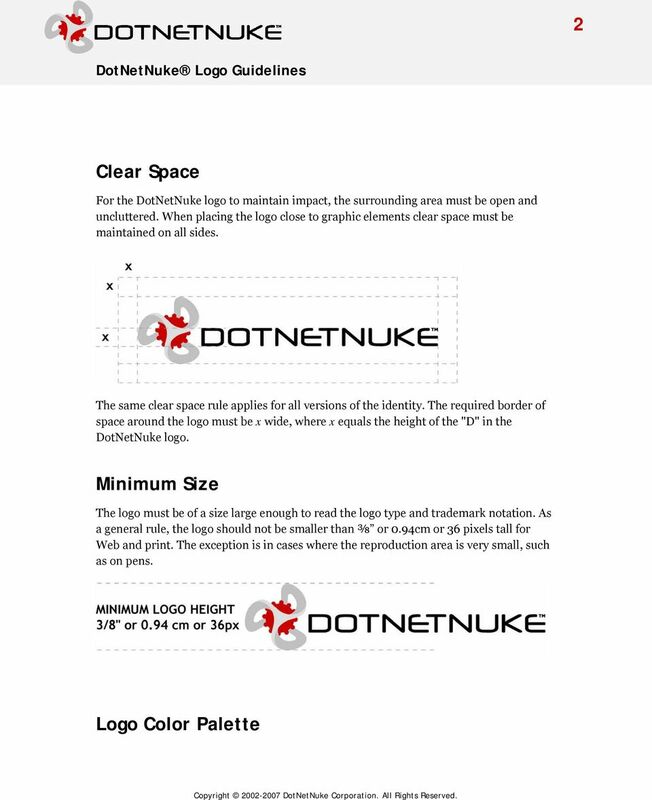 DotNetNuke Corporation may have patents, patent applications, trademarks, copyrights, or other intellectual property rights covering subject matter in this document. 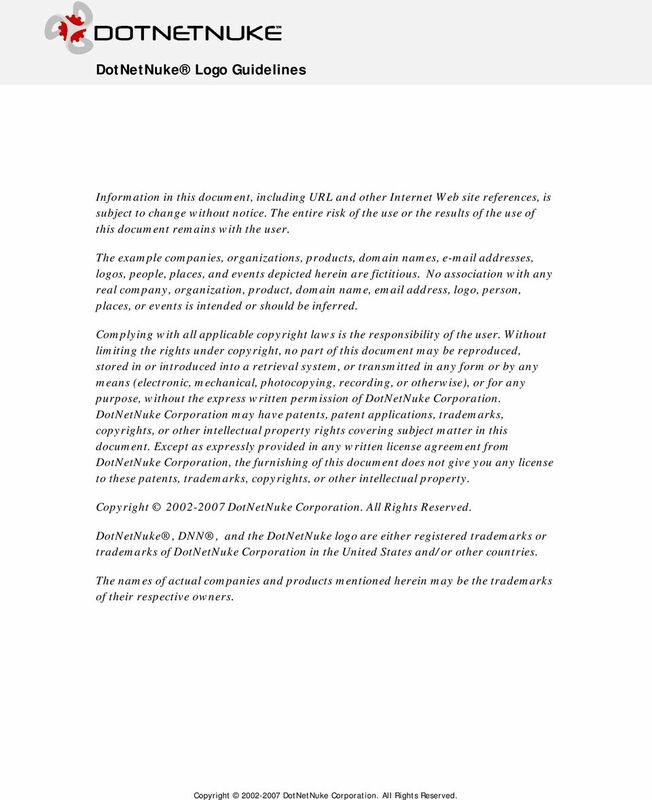 Except as expressly provided in any written license agreement from DotNetNuke Corporation, the furnishing of this document does not give you any license to these patents, trademarks, copyrights, or other intellectual property. 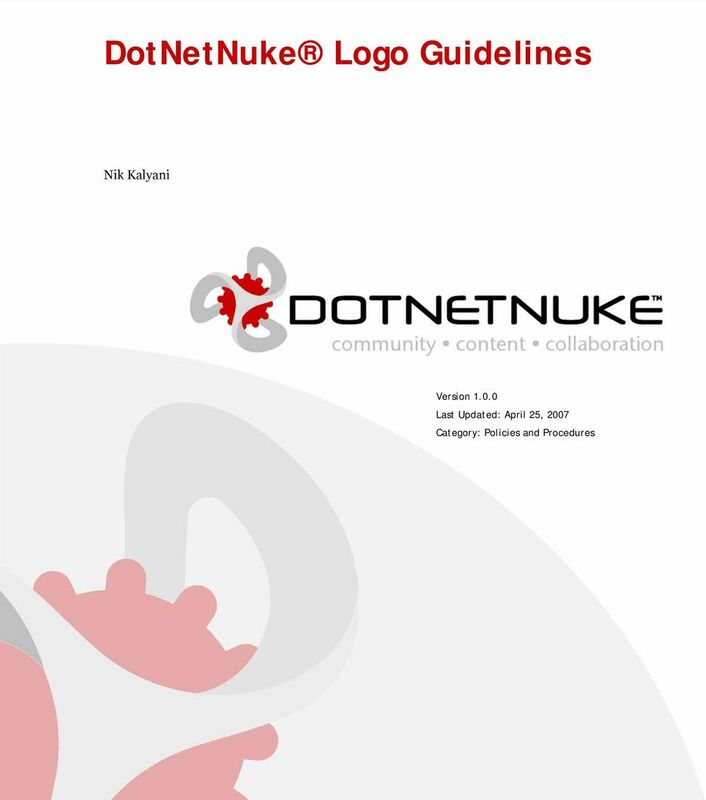 DotNetNuke, DNN, and the DotNetNuke logo are either registered trademarks or trademarks of DotNetNuke Corporation in the United States and/or other countries. The names of actual companies and products mentioned herein may be the trademarks of their respective owners. 3 Abstract The purpose of this document is to enable DotNetNuke community members to create communications materials that present a single, strong, instantly recognizable logo brand for DotNetNuke. 9 4 Background The color logo can be used on a black or white background, although a white background is the preferred choice. Black and White Logo The black and white logo should be used on a white background. When placed on a black background, the logo should be reversed. Translation The logo may not be translated or localized into any other language. Special Uses On occasion, the logo may be integrated with other graphic elements for special uses such as DotNetNuke sub-brands, buttons etc. 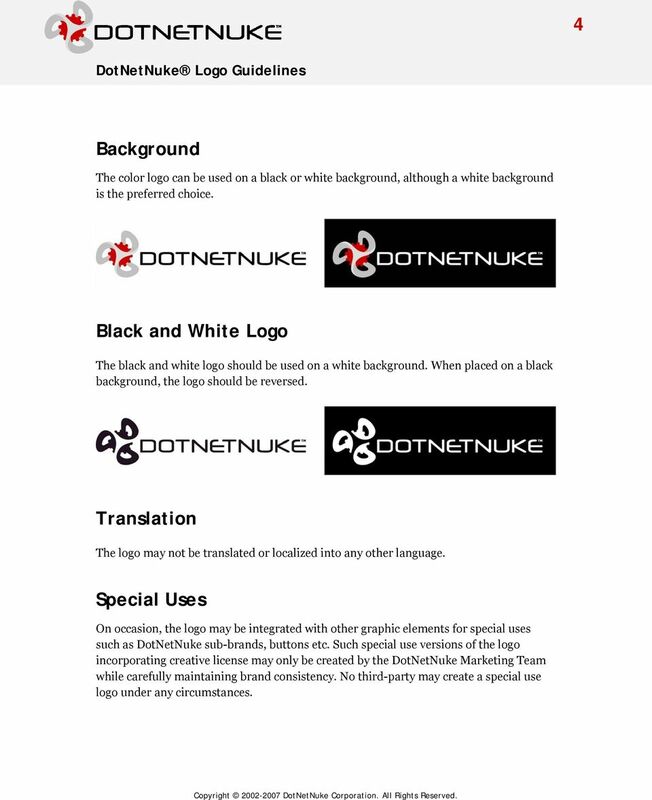 Such special use versions of the logo incorporating creative license may only be created by the DotNetNuke Marketing Team while carefully maintaining brand consistency. 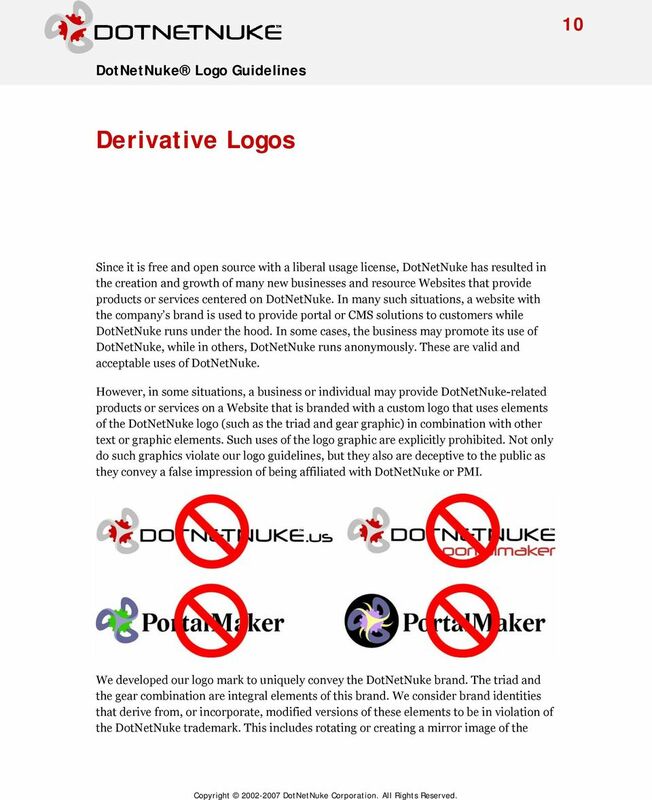 No third-party may create a special use logo under any circumstances. 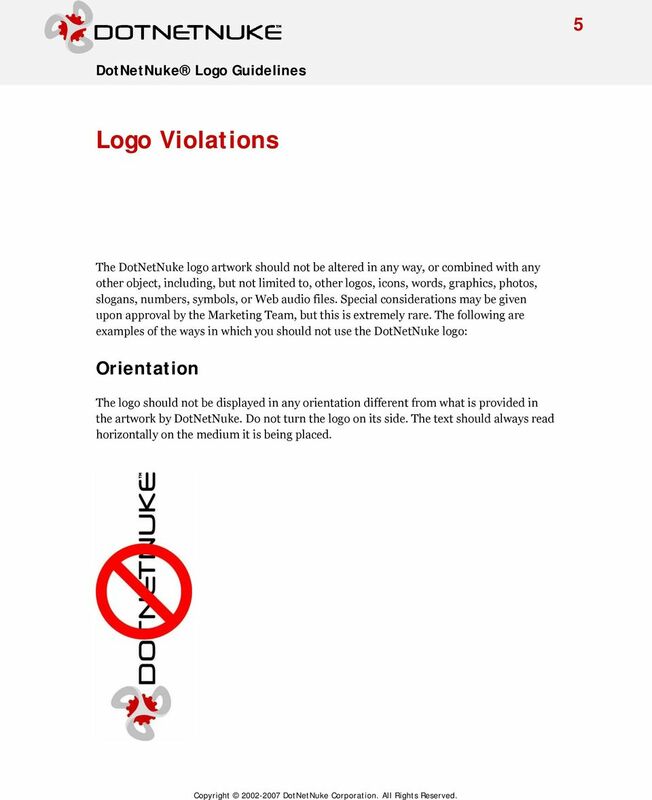 10 5 Logo Violations The DotNetNuke logo artwork should not be altered in any way, or combined with any other object, including, but not limited to, other logos, icons, words, graphics, photos, slogans, numbers, symbols, or Web audio files. Special considerations may be given upon approval by the Marketing Team, but this is extremely rare. 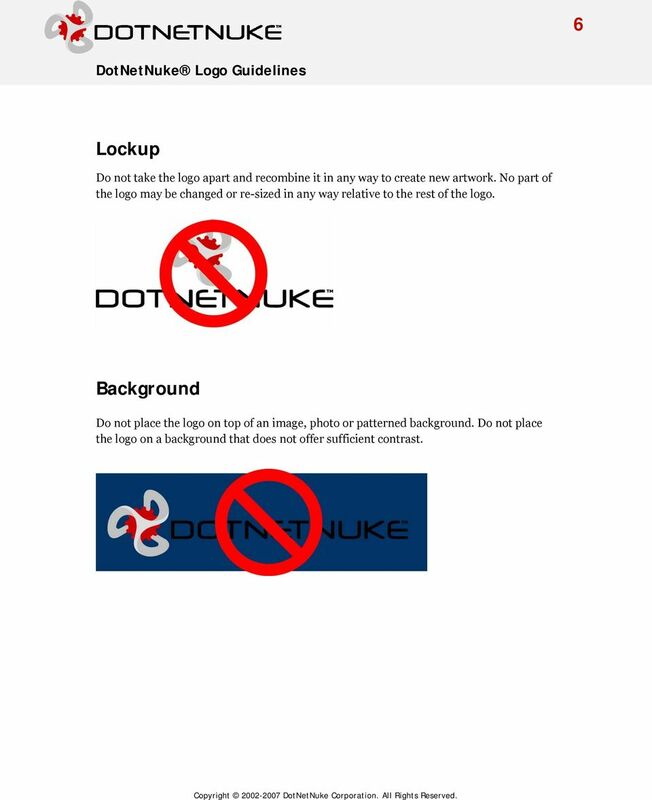 The following are examples of the ways in which you should not use the DotNetNuke logo: Orientation The logo should not be displayed in any orientation different from what is provided in the artwork by DotNetNuke. Do not turn the logo on its side. The text should always read horizontally on the medium it is being placed. 11 6 Lockup Do not take the logo apart and recombine it in any way to create new artwork. No part of the logo may be changed or re-sized in any way relative to the rest of the logo. Background Do not place the logo on top of an image, photo or patterned background. Do not place the logo on a background that does not offer sufficient contrast. 12 7 Drop Shadow/Border Do not use the logo with a drop shadow, or create any type of border around it. 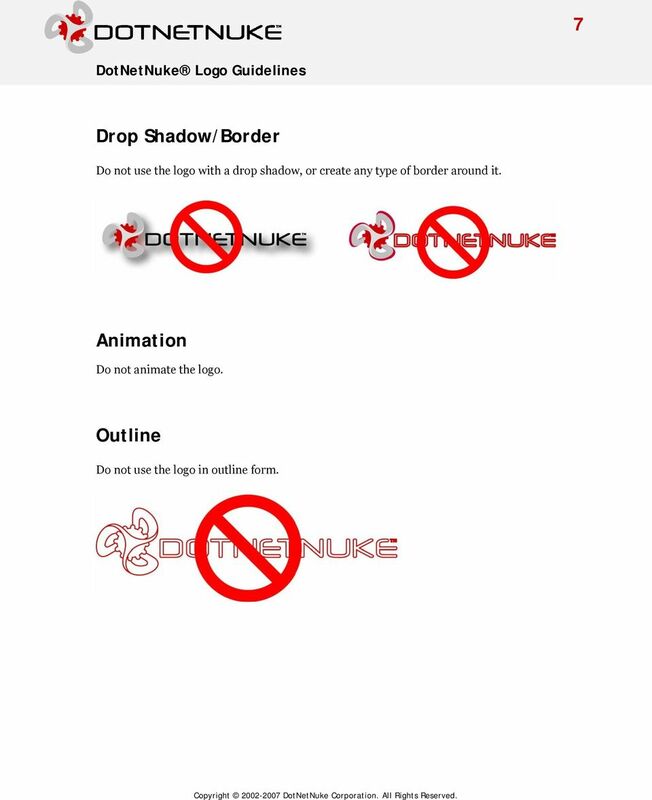 Animation Do not animate the logo. Outline Do not use the logo in outline form. 13 8 Trademark Do not reproduce the logo without the appropriate TM or symbol. Stretching/Resizing Do not distort the logo by stretching or resizing. If resizing is needed, it should only be done with the proportions intact. 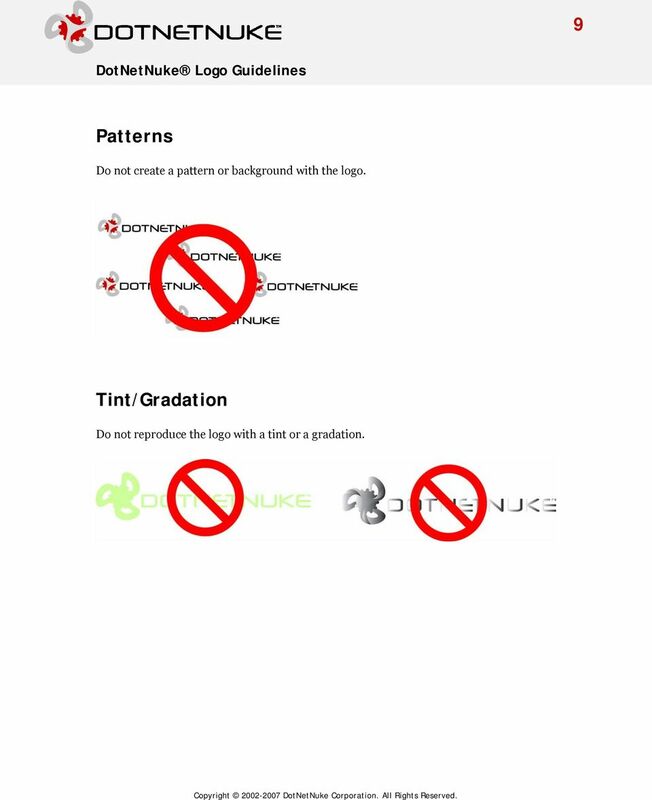 14 9 Patterns Do not create a pattern or background with the logo. Tint/Gradation Do not reproduce the logo with a tint or a gradation. 16 11 triad, duplicating the triad, changing fill or stroke color, changing line width, replacing the gear with a circle or other graphic element, adding additional lines or shapes, etc. 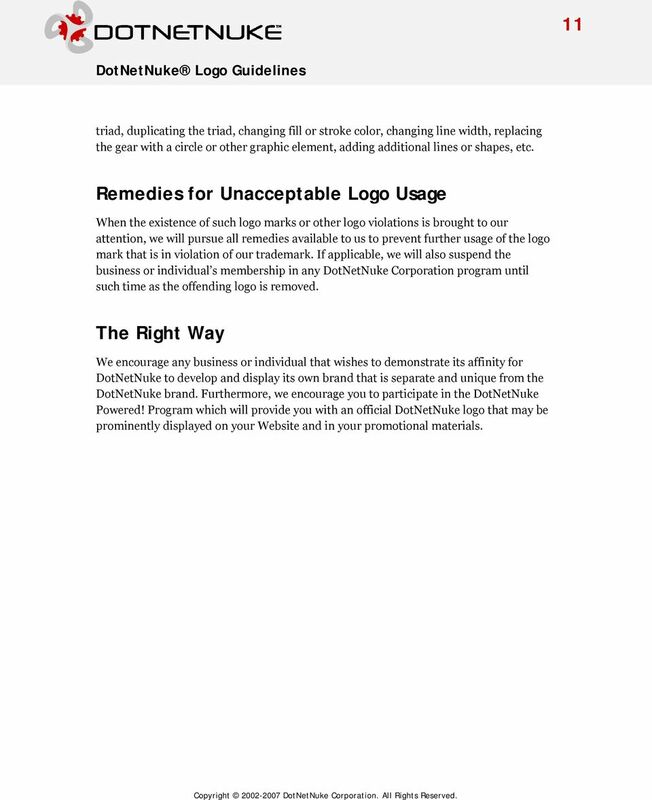 Remedies for Unacceptable Logo Usage When the existence of such logo marks or other logo violations is brought to our attention, we will pursue all remedies available to us to prevent further usage of the logo mark that is in violation of our trademark. 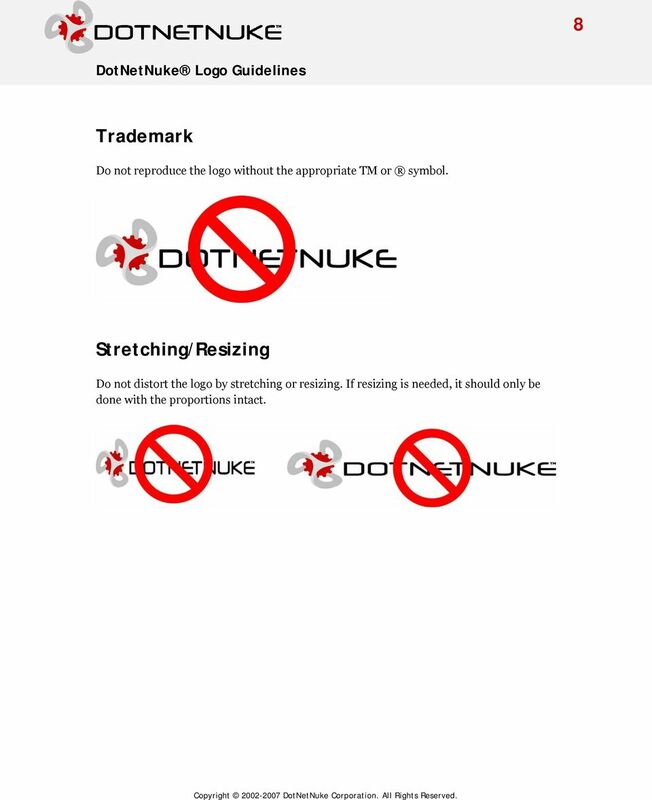 If applicable, we will also suspend the business or individual s membership in any DotNetNuke Corporation program until such time as the offending logo is removed. 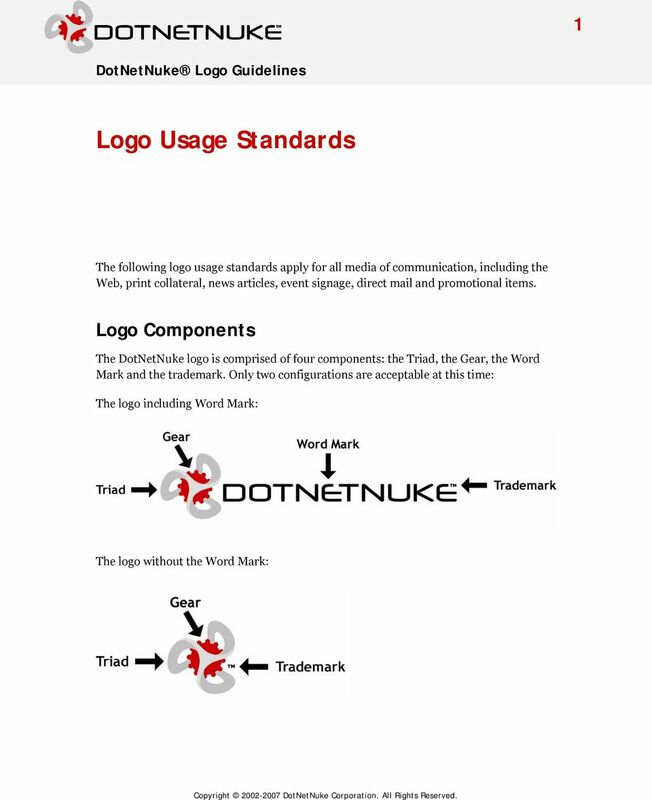 The Right Way We encourage any business or individual that wishes to demonstrate its affinity for DotNetNuke to develop and display its own brand that is separate and unique from the DotNetNuke brand. Furthermore, we encourage you to participate in the DotNetNuke Powered! Program which will provide you with an official DotNetNuke logo that may be prominently displayed on your Website and in your promotional materials. 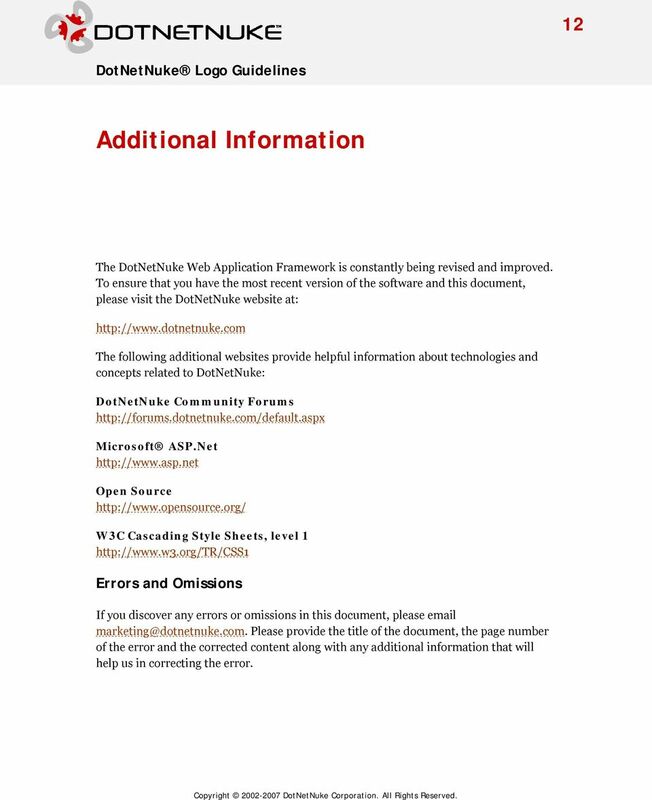 17 12 Additional Information The DotNetNuke Web Application Framework is constantly being revised and improved. To ensure that you have the most recent version of the software and this document, please visit the DotNetNuke website at: The following additional websites provide helpful information about technologies and concepts related to DotNetNuke: DotNetNuke Community Forums Microsoft ASP.Net Open Source W3C Cascading Style Sheets, level 1 Errors and Omissions If you discover any errors or omissions in this document, please Please provide the title of the document, the page number of the error and the corrected content along with any additional information that will help us in correcting the error. 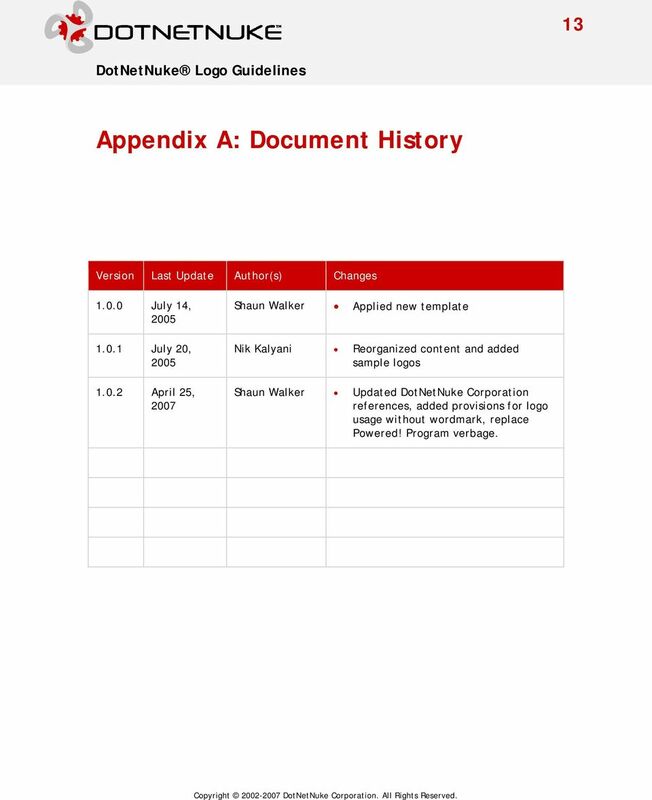 18 13 Appendix A: Document History Version Last Update Author(s) Changes July 14, July 20, April 25, 2007 Shaun Walker Applied new template Nik Kalyani Reorganized content and added sample logos Shaun Walker Updated DotNetNuke Corporation references, added provisions for logo usage without wordmark, replace Powered! Program verbage. 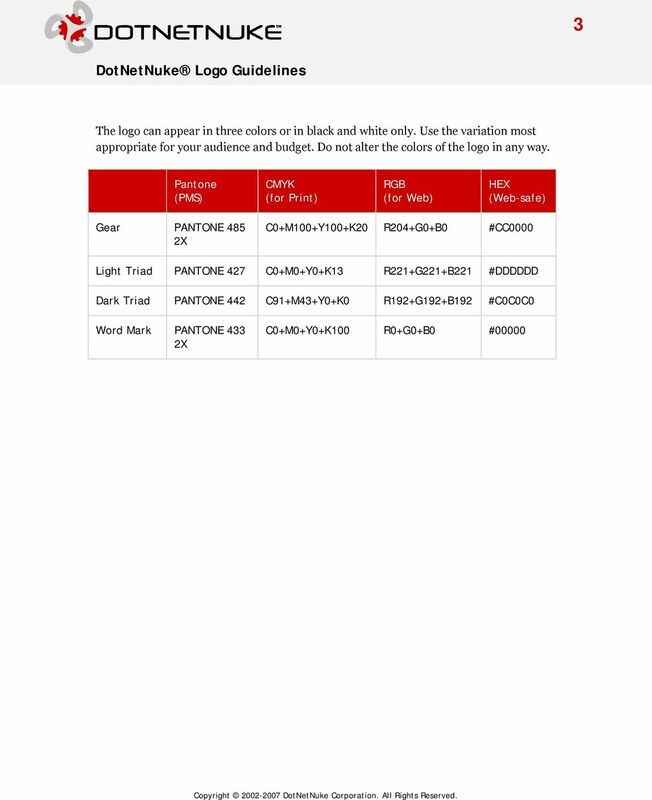 Lab Answer Key for Module 6: Configuring and Managing Windows SharePoint Services 3.0. Table of Contents Lab 1: Configuring and Managing WSS 3. 2015 Forest Stewardship Council, AC. All rights reserved.